Costless Tarp's Heavy duty 12 mil tarps are 6" less than the stated size. For instance, a 10x10 tarp is 9'6" x 9'6". 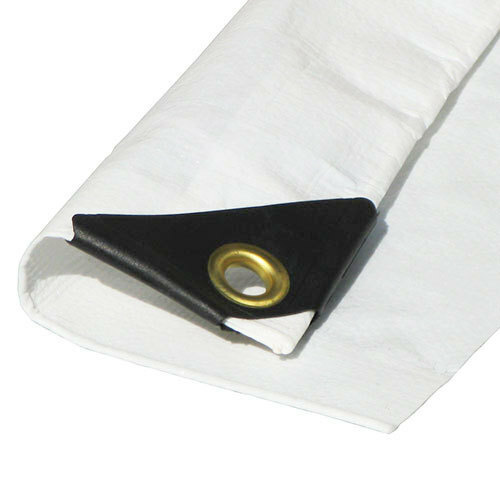 This is due to the hemming process that uses 6" of tarp to create a durable fold for the grommet application. 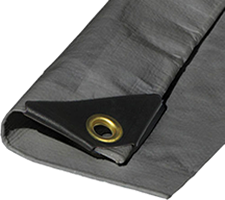 Each heavy duty 12 mil thick tarp has grommets spaced approximately every 18" on all four sides. Our heavy duty 12 mil tarps come in green, white, silver, clear and tan. Some customers share that the silver color is the most reflective and creates the darkest environment. Those who prefer to create a lighter space underneath the tarps prefer white or tan. Our green tarps blend in with trees, shrubbery and grass. Clear tarps have a reinforced white threading throughout the tarp for durability. The clear tarps allow light through and are great for protecting plants from frost. Clear tarps are great for kennels, carports, dividers or any application where light is desired. Heavy Duty Tarps are made of 6oz. 12mil poly (polyethylene) material with a durable 12 x 14 weave. 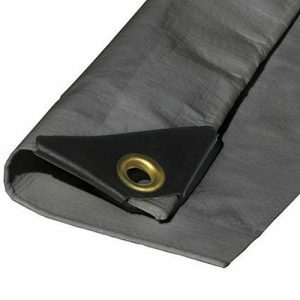 All poly tarps are heat sealed and laminated with rope-reinforced edges. They also have reinforced corner guards for greater pull resistance. All heavy duty 12 mil Poly tarps are waterproof and UV-resistant. Our heavy duty 12 mil tarps come in green, white, silver, clear and tan. Clear tarps have a reinforced white threading throughout the tarp for durability. The clear tarps allow light through and are great for protecting plants from frost. Clear tarps are great for kennels, carports, dividers or any application where light is desired. Use ball bungees to fasten tarps down. Tarps are most wind resistant when properly fastened. Ball bungees allow the tarp to give rather than being held tight which may pull out grommets.